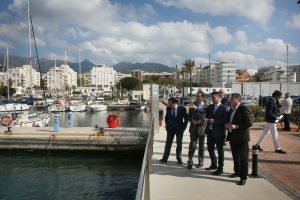 Marbella’s Mayor, José Bernal, and the Minister of Development, Felipe López, visited the Puerto de la Bajadilla, in Marbella, over the weekend and made assurances that there will be “full cooperation” between the two administrations to ensure that the port expansion project becomes a reality. The visit follows the failed project involving Sheikh Al-Thani which was plagued by delays and failures from the start. The councillor explained that the City Council and the Andalusian Government have held a meeting to address the future of the port. He said that “our interest is that, once the legal situation is resolved, the work will be executed immediately”. The Minister of Public Works is hoping that the High Court of Justice of Andalusia (TSJA) will dismiss the request for precautionary measures that the previous concessionaire had so that they “will have the freedom to act with the highest speed possible” and to “tender a new and transparent public tender”. The mayor stated that they understood a lot of time has been wasted. However, the delays are not attributable to the administration. “We have unfortunately reached this point because of repeated failures by the previous tenderer, which led us to rescind the concession”. The city council say that their main objective is to open a window of business and employment opportunities for Marbella. They also stress that the board, given the recent failures, has assumed control to “guarantee public services”. Lastly, Bernal pointed out that the existing enlargement project could still be used as a starting point. “[the plan] has the relevant costs and environmental authorisation and, if there is a substantial change, it would have to be started from scratch, which will not help the project to move forward at the speed we desire”. The original plan for Puerto de la Bajadilla tendered by Abdullah Bin Nasser Al-Thani included enlarging the marina to house 1,220 sport crafts of between 6 and 125 meters in length, as well as being able to handle cruise liners of up to 170 meters. A large commercial centre and hotel were also included in the plans. The project stalled due to late or failed payments as well as missed deadlines.